Gilbert Osmond came to see Isabel again; that is, he came to Palazzo Crescentini, where he had other friends as well. But Mrs. Touchett noted that in the course of two weeks he called five times, and she remembered that in earlier years he had visited her once or twice at most, even during those periods when Madame Merle was with her. No, Isabel was the attrac­tion and apparently a very satisfying one. Osmond was a lover of the beautiful and the elegant, and was naturally curi­ous ababout so interesting a subject. Mrs. Touchett was not long in remarking to Ralph that it was plain what Mr. Osmond was thinking of and Ralph answered that he too had recently come to the same conclusion. Personal­ly, Mrs. Touchett had nothing against Mr. Osmond. For some years she had numbered him among her acquaintances without knowing by what act or means he had gained this place. Pos­sibly, he was recommended to her by his appearance of being well able to do without her as she was able to do without him. It now gave her little satisfaction, on the other hand, that he had taken it into his head to marry her niece. She easily re­membered that the girl had refused an English lord; and a young lady who had successfully resisted the many attractions of Lord Warburton should not waste her time on anyone so little dis­tinguished as Gilbert Osmond. Mrs. Touchett said to Ralph—to which Ralph returned that Isabel’s listening was one thing, and her answering, quite another. He said that Isabel had already listened to several parties, but had made them listen in return. Ralph, in fact, seemed to be enter­tained by the whole idea, and he looked forward, he said, to a fourth, a fifth, a tenth gentleman asking for Isabel’s hand. He was sure she would not stop at a third. Yet this explanation failed to satisfy Mrs. Touchett, and so she also spoke to Madame Merle on the same subject. Madame Merle expressed great surprise and said that such a thought had never occurred to her. “Then I shall ask Isabel directly,” said Mrs. Touchett. “Then I myself shall ask him,” said Madame Merle bravely. “But what business is it as far as he is concerned of yours?” asked Mrs. Touchett. “Let me know, then, how you make out,” said Mrs. Tou­chett. 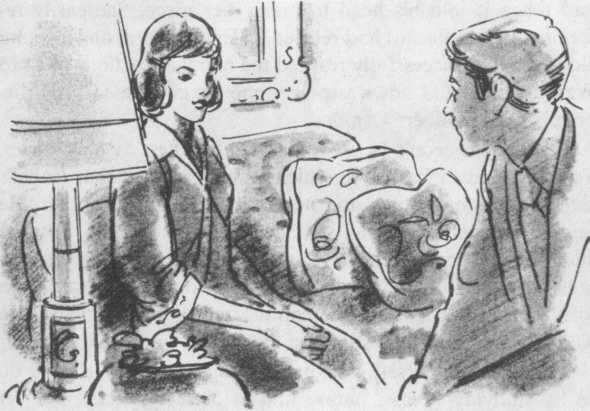 Yet, when a few more weeks passed in the same way, she continued to be little pleased by what she felt was the studied manner in which Mr. Osmond went on paying his respects to her pretty young niece. Toward the end of May Isabel made a trip to Rome. Miss Henrietta Stackpole, her American newspaper friend, whom she had seen in London and also during her stay in Paris later, had worked her way down, as she said, through the cities of North Italy, and arrived at last in Florence. She had spent a few days with Isabel at Palazzo Crescentini and then the two friends decided to visit Rome together. Ralph accompanied them to the ancient city. Naturally, Isabel enjoyed Rome great­ly, and her impressions were such as one might expect from a young person of her fresh and eager character. She had always been fond of history, and here there was history even in the stones of the streets. Gilbert Osmond managed to make a visit to Rome at this same time. Isabel had first suggested to him rather casually that he try to come while she was there, and although he had hesi­tated about leaving Pansy alone in Florence he had finally made arrangements as to her care. He arrived a few days after the others but immediately joined company with them. His knowledge of Rome and of its many art treasures naturally helped to make the whole visit much more enjoyable. Even Ralph had to admit that, under the circumstances, Gilbert Os­mond made a most pleasant companion. He spent a part of each day with Isabel, Ralph, and Miss Stackpole, and ended by affecting them all as the easiest of men to live with. His good humor never changed; his knowledge of the right fact, his use of just the right word, always proved proper to what­ever the occasion. Clearly, he himself was amused and happy. when Osmond called at the Palazzo Crescentini? 2. Why wasn’t Mrs. Touchett pleased that Osmond was think­ing about marrying Isabel? 3. Why did Ralph think that Isabel would refuse Osmond? 4. Why didn’t Madame Merle think that Mrs. Touchett should ask Isabel about Mr. Osmond’s intentions? 5. Why didn’t Mrs. Touchett want to ask Osmond himself about his intentions? 6. Why did Madame Merle think that she was the right person to speak to Osmond? 7. Who came to visit Isabel in Florence? 8. What did Isabel and Henrietta decide to do? 9. Who accompanied them to Rome? 10. Why did Isabel enjoy Rome? 11. Who made a visit to Rome at the same time? 12. How did he make the visit more enjoyable? 13. What did Osmond express in a piece of poetry that he wrote and gave to Isabel? To delay in Rome was very pleasant, but Isabel let her aunt know she would immediately join her. She told Gilbert Os­mond she had done so, and he answered that, having made the trip to Rome, he planned to stay there a little longer. He would therefore not return to Florence for ten days more, and in that time she would have started for Bellaggio. It might be months in this case before he should see her again. “Well, Italy’s a part of the world,” Isabel answered. “You still have no respect for my travels do you?” remarked Isabel. “I think that what you propose is excellent,” objected Os­mond at once. Isabel was thinking at the moment that this pleasant period of her life so happy had been these last few days in Rome was coming to an end. Therefore, she paid little attention to the grave tone that had suddenly crept into Osmond’s words. She said to herself that if there was a danger that they should not meet again, perhaps after all it would be as well. Happy things don’t repeat themselves, and her adventure seemed al­ready to be running its course. She might come back to Italy and find Osmond different this strange man who pleased her just as he was; and it would be better not to come back than to run this risk. “Ah, I can’t advise you as to that without knowing what it is,” said Isabel suddenly, giving him her attention once more. “I don’t believe it,” said Osmond. “You may be angry at times that is quite possible. But I am sure you are never ‘cross.’ ” He leaned forward, a hand on each knee; for some moments he looked down at the floor. “Anyway, I may as well tell you now,” he said at last. “Tired of hearing it from others?” He sat there raising his eyes to hers. Isabel had turned away, but in the movement, stopped her­self and again looked toward him. Soon he got up and came near her, deeply respectful, as if he were afraid he had been too familiar. “I’m completely in love with you,” he said. “Don’t say that, please,” said Isabel. Her emotions were con­fused, and, for some reason she could not understand, tears seemed to be forcing themselves into her eyes. “I haven’t the idea that it will matter much to you,” Os­mond said. Osmond spoke these words simply, almost innocently. His tone was that of a man who expected little from what he said, but who spoke for his own needed relief. Isabel was, of course, deeply affected; his words seemed to her, as he stood there, both beautiful and generous. Yet at the same time something within her made her draw back just as she had done before in situations of a similar kind. “I’m not at all offended, as you rightly supposed,” she finally managed to say, though her words hardly mirrored her true emotions. “Of course, I don’t agree with you there,” said Osmond. “I don’t at all know you,” Isabel added suddenly and then colored as she heard herself saying what she had said almost a year before to Lord Warburton. “If you were not going away, you would know me better,” Osmond returned. “I shall do that some other time,” said Isabel. And when Os­mond remarked that he was really an easy person to know, she answered that she hardly agreed with this. “But you are wise enough to understand anyone easily,” Os­mond continued. He did not leave immediately, but first asked Isabel whether she would kindly call on his daughter before she left Florence. Isabel said she would do this with great pleasure. They then talked for a moment or two longer about Pansy, after which Osmond took a rapid, respectful leave. When he was gone, Isa­bel stood a moment looking about her and then seated herself slowly with the air of a person in deep thought. What had hap­pened was something that for a week her imagination had been going forward to meet. But here, when it came, she stopped and drew back in fear. The workings of this young woman’s mind and spirit were, in truth, sometimes strange even to her­self. It seemed to her more difficult each day to decide upon the course her life should take.
. 1. Why did Isabel decide to leave Rome? 2. Why would it be a long time before Osmond saw Isabel again? 3. What was Isabel thinking about while Osmond was talking to her? 4. How did Osmond say that he felt toward Isabel? 5. Why did he say that he was telling her his feelings? 6. What answer did Isabel make to Osmond? 7. What did Osmond ask Isabel to do before she left Florence? 8. What did Isabel think about when Osmond had left?